Approximately 1 week ago another veterinarian took her own life. Suicide rates among veterinarians is approximately double that of dentists and doctors and is up to 6 times higher than the general population. This is a scary statistic. Our Client Service Reps are the front line of our clinic. They field phone call after phone call, are the first greeting for our clients when they come in, they weigh patients, take them to the exam rooms, deal with bill payments, and then they are the final face when our clients leave. This may not seem too tough – after all, they get to love up all the sweet animals that come in! Although that is true, they also deal with clients who are stressed because their pet isn’t well, they field calls for the doctors, they help clients determine if the situation they are experiencing is an emergency… they have the tough job of having to turn clients away in the event that we aren’t able to provide them with the emergent care they are needing. Our CSR’s deal with our clients not only in the most stressful times, but in the most heartbreaking as well – they have to ask what choices you want for the end of your pet’s life, they have to manage a delicate balance to get your consent, go over your options and accept your payment, all while trying to be quick and efficient, so as to not get in the way of your grieving. For those of us who have been here a long time many of these patients we have known since they were just wee, when they first came into your life, they came into ours. We all grieve with you, try hard not to show it too much – we need to continue on with the next client, the next patient… but our heart breaks too. Next are our licensed veterinary technologists -these dedicated people are the right hand to the doctors. They assist in patient care, they monitor your pet during surgery, they assist in every aspect of your pet’s care where more than the doctor’s hands are needed. All the while in doing this, they are often working to soothe a pet that is distraught about what is happening, they work to find the best holds to ease the patients stress while also protecting themselves and the doctors, if needed. They are highly trained to know the subtle signs when a patient isn’t dealing with anesthetic well, aren’t recovering well, require more pain medications. They draw up medications, dispense them for patients, educate clients, they have a wealth of knowledge to share. They too field calls, help to educate a client when a doctor isn’t available. The techs’ love and compassion for animals and their well-being is their driving force. As with everyone else in the clinic, they hurt and have heartbreak when all doesn’t go well and are frustrated too when a patient isn’t improving. Finally we have the veterinarians -they have the hardest job of all -their patient’s can’t tell them what is wrong. The patient can’t tell them what they ate, where it hurts, what they did. Veterinarians rely on what information the owner can provide, they rely on their education, their experience, the physical exam, the use of diagnostics to determine what is happening. We are fortunate that in our hospital our doctors work as a team so they can rely on each other to review cases, find a new perspective, do their absolute best for the patient. Sometimes it is the ruling out of things that helps to determine what is actually going on, which can be frustrating to an owner, but know that they ALWAYS have the best interest of the patient in mind and at heart. They don’t want to see your pet suffer any more than you do and they have the super tough job of working to get them back to health when they aren’t well. The doctors also work with the client on top of caring for the patient, trying to help ease the owner’s stress and concern while determing the best course of action to take. One of the hardest parts can be giving options available without influencing a decision, educating the client without putting their own personal take on what they would do. Then there are those horrible moments when the harsh reality of an older pet or a really sick pet is that it is time…time to let them go, nothing more can be done. This is awful news to have to deliver, it breaks our doctor’s hearts as much as it breaks yours. And, when the final time does come, they are with you, with their patient, right to the end. Feeling your grief, while trying to not show theirs. Everyone in the clinic also has the added stress when a client has a sick pet and limited funds. It breaks our hearts to know that we will be limited in what we can do for that patient. As much as we would like to help everyone at no cost, the reality is, we don’t get government funding, if the clinic doesn’t get paid, noone that works here would get paid. The doctors always do what they can, looking at all the options for what can be done with the funding the client has available. We offer finance options to help aid the client so they can get the care their pet needs now. Plus there are those stressful times when a client declines testing or declines treatment. It pains all of us to know that the outcome likely will not be good, that the patient will suffer because of an untreated condition or the pain they are feeling, but in the end it is the owner’s decision to make, our doctors can only provide their findings and give their recommendations and gently encourage clients. This profession, this field, can be stressful, it can be harsh, it can feel unrewarding. When we are having a tough personal day, or have had a tough run in with a difficult cleint, or have a patient where it wasn’t a positive outcome for that appointment, we have to push that aside for the next client, the next patient, we aren’t allowed to have an “off” day. We need to be our best for everyone and we always strive to make that true. Your pet is just as important to us as the last patient and as the next patient will be. On the flip side, there are most definitely very rewarding days, appointments, moments. They are definitely snuggly puppies and kittens, loveable adult pets, interesting and exotic pets, enduring senior pets. They are successful emergency surgeries, there is satisfaction in seeing a pet improve and become well again, there are clients who let us know our hard work does not go unnoticed. There are good days and bad days in this field and remember that we too are people, that we care about your pet just as you do, and everything we all do is with the best interest of each patient in our minds and hearts. Why Is The Suicide Rate for Veterinarians So High? What is That in My Pet’s Ears? It is far more common and highly likely for your kitten to have ear mites than to not have them. Adult cats if recently acquired from a rescue or humane society or found stray may also have ear mites. 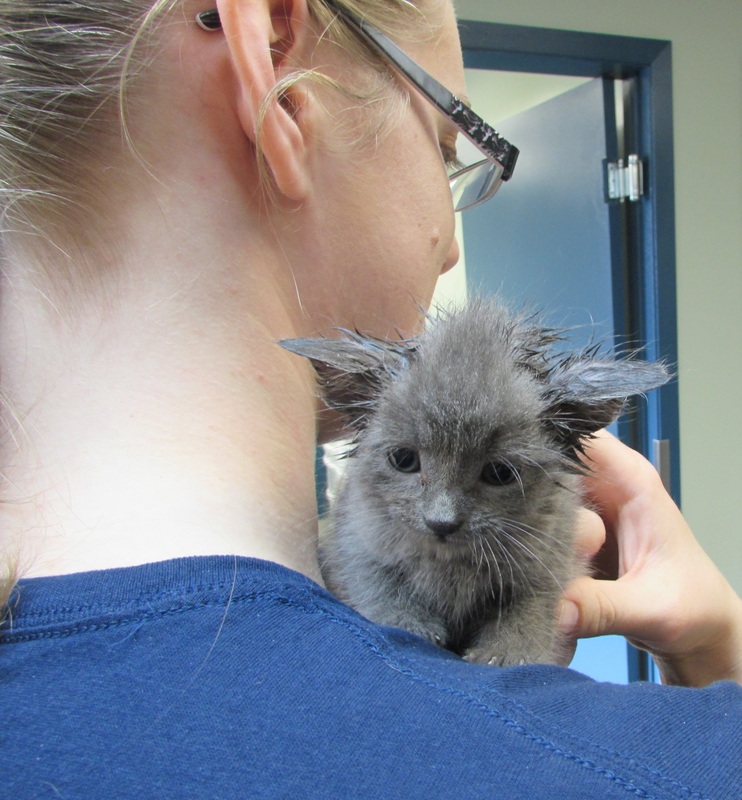 Most often this is taken care of and treated on their first ever visit to the vet. It is much less common for puppies and dogs, often if their ears are bothering them they likely have another type of infection like yeast or bacteria, although they can definitely get ear mites. 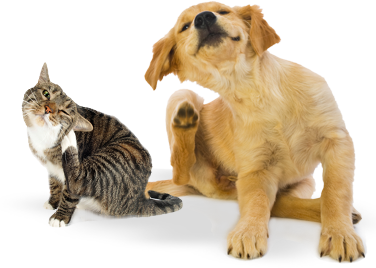 The best, quickest and most guaranteed way to get rid of ear mites is to bring your pet in to see your veterinarian. Often mites can be diagnosed on physical exam, however your veterinarian will likely take a swab of the debris to check under a microscope and confirm the presence of ear mites and assess that no other infection is present. The ears are then flushed and thoroughly cleaned to remove all the mites and debris. Your pet will also be treated with a prescription medication to kill any remaining mites and prevent the infestation from recurring. Be sure to let the vet know if you have other pets at home that spend a lot of time together or sleep in the same place as the pet that has mites. All those pets at home should also be treated to prevent mites from continuing to pass from one pet to the other. If the pet at home has a lot of debris in the ears, it is a good idea to bring them in to get their ears flushed as well. This is not something that should be done at home as you wouldn’t want to accidentally cause damage to the ear drum or ear canal. Can you treat at home? There is an over-the-counter treatment for ear mites, however if there is any uncertainty (especially in dogs) that the ear infection is mites, it is best not to use this medication. 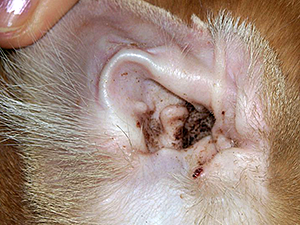 A downside to home treatment is that unless the ears are cleaned and the product is used exactly as directed, including the repetition of the medication a few weeks later, it may not resolve the problem completely, resulting in the same issue for your pet a few weeks down the road as the mites continue to re-infest the ears. We have also had clients who used the product exactly as directed and it still did not resolve the problem. The great thing about mites is that they are fairly easy to get rid of and don’t often recur when done with the aid of your veterinarian. If you have any questions about ear mites, your pet’s potential ear infection or anything else related to your pet’s health please contact your veterinarian. Ear mite seen under a microscope. In our current era mobile devices are everywhere! Having a smartphone means we have almost everything at our fingertips – 24/7. We can access our bank accounts, check our email and Facebook, take photos and even play our favourite games. We find life is busy, always seemingly on the go, making it difficult, even with our smartphones, to have time to do small tasks like call to schedule appointments or call in prescription refills. Here at Albert North we decided approximately 2 years ago that we wanted to be able to make it even easier for our clients to connect with us, and with that in mind we developed our Mobile App. We wanted the app to be functional with helping clients to contact us, providing some basic medical information for those times when we can’t be reached, and to have special promotions just for our App users. Today we have almost 1000 users and that number seems to be growing daily. Email sign-up – receive email notifications about health concerns, happenings in clinic, changes to hours, etc. Events – information on events like Dental Month, Photo Contests, etc. We are continually looking at more ways to make the App of benefit to you, so if you have an idea, please feel free to share with us. You can do this from within the App under the Book/Refill tab – simply click on Contact Us! Here in Saskatchewan, well Canada really, it isn’t unusual to have drastic changes in temperature. Going from -40C one week to +3C the next, can be a common occurance. Although the warm weather may seem great, there are some disadvantages to having temperatures on the plus side at this time of year. Plus temperatures during the day and colder temperatures at night mean more sheets of thin ice. Ice as expected, presents a slipping hazard for everyone, including our pets, and just as we can injury ourselves, so too can they. The “bambi” slip (where back +/- front legs splay out from underneath) can cause strains to tendons and muscles that can take time to heal. This may mean requiring medication, rest, and even some massage or rehab work to get back to tip top shape. Avoid exercising your pet during the hours where frost and ice are forming. Here in Saskatchewan this can be tough as that may mean only a handful of hours in the day when the frost and ice are melted. If you can’t avoid these times, go slow. Be cautious of where you are walking. Don’t throw toys for retrieving in areas that are most prone to icy sections. With the new layers of ice even more salt/sand mixtures are being applied to roadways and ice melt being applied to walkways. The salt from the roadway can be harmful to a pet’s paws and can make them sick if they groom it off. Ice melt, if not pet friendly can also be hard on paws and potentially toxic if they lick it off. If you can’t avoid it (which at this point is near impossible), wash your pet’s paws off as soon as you get home. Also be sure if you are using any ice melt products on your walkways, that you are using a pet safe version. building a snowman and your mitts get wet, what happens to your hands? They get cold. Leaving them wet and cold could lead to frostbite or even hypothermia if the rest of your body gets chilled or other parts of you are also wet. The same holds true for your pets. Wet paws, fur, and possibly bellies can potentially lead to frostbite or hypothermia. Again avoiding is the best option although somewhat impractical. Instead, avoid lengthy periods of time outdoors in areas that have water built up, have your dog wear waterproof booties (provided they are tall enough to not allow water inside the boot), dry feet and underbelly when you arrive home. If you have driven to your exercise location bring a towel and dry bedding. Dry your pet’s feet and underbelly and ensure they aren’t laying on wet or damp bedding materials for the ride home. Taking advantage of the warmer weather is definitely more enjoyable than staying indoors and avoiding the hazards. Just take care and caution when out and about. Ensuring you and your pet are safe and warm will mean you both get to enjoy the best part of warmer winter weather – running and playing in the snow!